Tipsy Support the creators of content you like. Tipsy is a Chrome browser extension that will allow you to support online content. Just install the app and keep browsing as you always do. Tipsy will then remind you to donate to the creators of the content you like, giving more to the ones you liked the best. If you would like to join our group of Tipsy Publishers and be kept up to date with Tipsy news please enter your email on the right and click to join our Tipsy Publishers Google Group. Just include your PayPal email address, like in the example aboved. That's all! 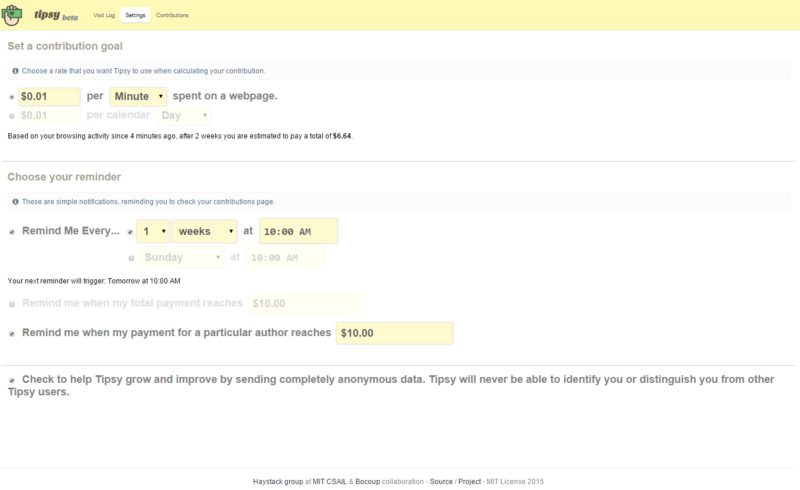 In order to accept Dwolla payments you will need to include your key in the author tag. In order to generate this key you need to create an account with dwolla. Then you need to generate a button. Don't worry too much about all the different fields or button types - it doesn't matter since all we need is the key. Once you've created the button, go back to this page. There, you should see your key. This is the key that would be in any button you place on a website, that would be visible to anyone lookig at the source. You can then include this as an attribute in the link tag described above like so: data-dwolla="kRrCD32hkwH0E7ldn/xeI/WCQKqR2dVPLuQjF6Bu/g4OlMnZa9". The name attribute is optional. It lets you choose how you would like Tipsy users to identify you. It does not have to be you real name. It can also be the name of your company or organization. The version number is used by Tipsy to decide what format version is being used. The current version nr. is 0.0.1. Tipsy will remember the tipsy.txt information since accessing it takes time. After a specified time, Tipsy will fetch the information again. You choose this time by choosing a cache duration amount (any integer number) and a cache duration unit which is h, d or w (hour, day or week). Make sure to leave a space between the amount and the unit. For example, if you want Tipsy to fetch the tipsy.txt information after 5 hours you would place 5 h in the second line. From line 3 and on you can place the payment information that apply to your content. The first entry, [url prefix], you place on the line is the url prefix of the page your content is on. For example, of you site is www.abc.com and you have content on www.abc.com/mycontent.html, you would place mycontent.html as the first entry of the third line. If you don't want to specify the sub-domains you should place a * for [url prefix] on line 3. The next entry lets you specify the payment processors and their information. For [payment processor 1] you could have paypal and for [info for payment processor 1] you could have your paypal email. Remember to place the "=" sign between them. You could place multiple payment processors and their respective inforamtion, just make sure to separate them by a "|". 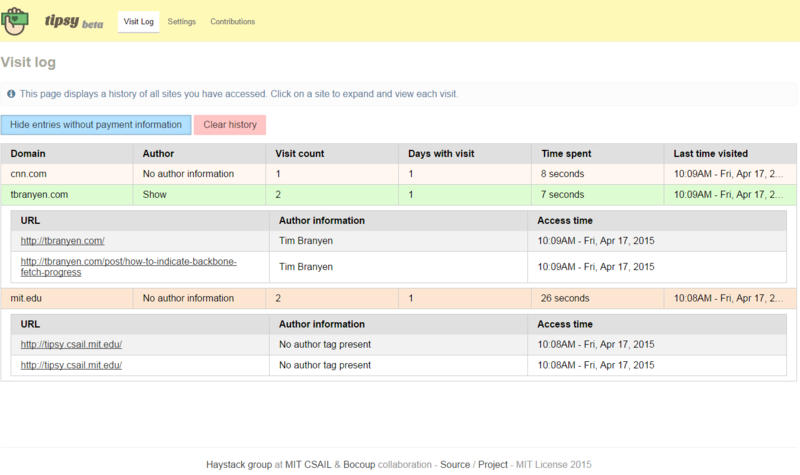 The last entry, [authorship info] is optional and lets you specify some information to indetify yourself to the user, eg. your name or the name of your organization. You are free to place whatever you wish. Make sure to keep a space between it and the last [info for payment processor]. You can specify as many different sub-domains as you need by just adding lines. Make sure you follow the format carefully. Line 1 starts at the top of your tipsy.txt. Leave a single space between each of the fields and don't forget the "=" and "|" signs for the payment information. To find your dwolla key follow the instructions in the previous section. Tipsy is a free to use and open source . Tipsy keeps a log of the pages you visited and how much time you spent on then. Content providers will have to place some author and payment information in their source so Tipsy can know how to pay them. See the source of this page for an example. You can configure how Tipsy will calculate contribution recommendations and how Tipsy will remind you to pay. Tipsy will calculate a suggested contribution and you can select to pay using the options provided. You can, of course, pay as much or as little as you want. Tipsy does not collect any money - you will be directed to the chosen payment processor's website. Tipsy is currently in testing mode. If you already are an approved tester or are a memeber of the Tipsy Users Google Group click the "Download Tipsy" button. Else you can try out Tipsy by joining the Tipsy Users Google Group. Enter your email and click on the button below to join. Once you've joined and been approved, you can try the download button again. Use this form to generate the Link Tag.